Had The Trouble with Billionaires been published just a few years ago, authors Linda McQuaig and Neil Brooks would have had a tough time getting readers to take their premise seriously. During the long boom that began in Bill Clinton’s first term and ended in George W. Bush’s second, billionaires did not give us any trouble at all. Lots of investors were getting rich in America’s stock and real estate markets. And they were too busy buying new cars and jet skis to waste time on class warfare. Then came the financial crisis of 2008, and its piggyback recession. Americans were not really rich after all, it turns out—they’d just felt flush thanks to overinflated home valuations. Amidst the nationwide carnage, only a tiny elite managed to keep getting richer: Wall Street tycoons were using exotic, ­custom-made financial derivatives to effectively sell short the entire American middle class. If ever there was a good time to dump on billionaires, this is it. Reading through The Trouble with Billionaires, one can pick up the distinct voices of its two co-authors. The marshalling of financial statistics and the case studies in taxation bear the imprint of Neil Brooks, professor at Osgoode Hall Law School. Linda McQuaig, a veteran left-wing book author and Toronto Star pundit, infuses the book with its spirit of social activism. 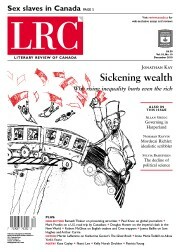 It is now easier for a poor person to become rich in Canada than in the laissez-faire US. The authors’ collaboration rests on their shared concern with income inequality. Societies, they argue convincingly, go off the rails when too large a gulf grows between haves and have-nots. During America’s early post-war years—an era marked by highly progressive tax rates and powerful unions—the top-earning 1 percent of Americans earned about 10 percent of national income. In America today, the top 1 percent earns 24 percent of national income. The last time the United States witnessed this level of inequality was 1928, the year before the Great Depression. Extreme income inequality does not just destabilize economies. According to the experts cited in The Trouble with Billionaires, it also is statistically associated with a wide range of social ills including crime, mental illness, infant mortality and reduced longevity. Income inequality decreases overall levels of societal trust—since people tend to feel disconnected from individuals who lie outside their socioeconomic stratum—and exacerbates the anxiety that springs from class envy. Societies with high levels of income inequality also tend to exhibit low class mobility. This helps explain why it is now easier for a poor person to become rich in Canada and the more socialist countries of Scandinavia than in the laissez-faire United States, where income inequality has soared to the stratospheric levels once reserved for Latin America. The authors present dot-com billionaires as a case study. However brilliant their computer programs and gadgets may be, they all would be worthless if bygone governments had not pumped billions of dollars into building the network of computers we now call the internet. For today’s Silicon Valley aristocracy, “that technology was simply a gift from the past, the product of the work of thousands of other people who came before them.” By imposing high tax rates on these ultra-rich individuals, the argument goes, government would simply be recouping its original investment. Conservative readers will dismiss these arguments as mere window dressing for socialism. But The Trouble with Billionaires is based on a very capitalist argument: that market economies prosper only when middle class families can buy all the products and services that factories and offices produce. In this regard, billionaires are problematic because they spend only a very small percentage of their income on things like breakfast cereal and dry cleaning—which means that redistributing their income to poorer people with hungrier children and dirtier clothes will expand the economy, thereby generating more jobs, more income and, in turn, more consumption. It was this virtuous cycle that kept the U.S. economy booming in the 1950s, 1960s and 1970s. But then came Ronald Reagan, the flattening of America’s tax structure, the rise to power of neo-conservatism, the birth of the knowledge economy, globalization, outsourcing and the contraction of organized labour—all of which conspired to put a larger and larger share of wealth into the bank accounts of the Americans who needed the money least. With cash to burn, these rich investors began inflating the market for increasingly exotic investments—including the complex asset-based securities that went toxic in 2008. I was surprised how reasonable I found many of the arguments in this book. Everyone else, meanwhile, has been stagnating. The housing boom masked the fact that median American household income has not budged in decades. People with what were once thought to be good, “middle class” professions—airline pilots, schoolteachers, police officers—often have to get second jobs to feed their families. The economy itself has not flatlined: in fact, the last two decades witnessed one of the great economic booms of human history. But virtually all of the gains from automation, digital technology and free trade that made that boom possible have gone into the pockets of the ultra-rich. As The Trouble with Billionaires moves from chapter to chapter, the authors become more ambitious with their arguments, extending them into the political realm. Very rich people, they argue, have an inherently corrupting influence on democracy, since they inevitably use their massive wealth to influence lawmakers and thereby distort public policy. By way of example, McQuaig and Brooks tick off the many ways in which American politicians and bureaucrats abetted the 2008 financial crash through deregulation. In the early post-war period, they note, Wall Street firms were smaller because they typically were forced by law to act as partnerships. Since each partner was liable for the debts of the whole, bankers and fund managers made conservative investment decisions and avoided assets whose structure they did not understand (such as the elaborately securitized subprime mortgages at the heart of the recent cataclysm). The campaign to rein in billionaires, the authors argue, must start with rules that bring back the old regulatory firewalls that once protected us from 1929- and 2008-style financial meltdowns. In their concluding chapter, the authors focus squarely on policy prescriptions for Canada. They advocate a marginal tax rate of 60 percent for incomes above $300,000 and 70 percent for incomes above $2.5 million. McQuaig and Brooks also urge the creation of a Canadian inheritance tax and new initiatives to improve public education, provide more affordable child care and build more affordable housing. In regard to international financial transactions, they embrace the implementation of a small Tobin tax on speculative investments and the elimination of tax shelter schemes that benefit the ultra-rich. More broadly, they urge a fundamental change in the way we regard taxation and public services: “The neo-conservative movement has been successful in directing public anger toward taxes. It will only be possible to rebuild a properly progressive tax system once the neo-conservative misconceptions are exposed and an appreciation of the importance of taxation in a democracy is restored … In essence, taxes are about collectively creating things of value in a democracy … They are … the price we pay for membership in the community and for citizenship in a democracy.” Those who cheat the taxman, the authors add, should “be treated with disdain, as anti-social members of the community.” They even suggest that all tax returns should be made public (as they are, apparently, in Finland), so we can all ensure that our fellow citizens are paying their fair share. Given the somewhat radical left-wing bona fides of McQuaig (she once wrote a Toronto Star column alleging that the 2001 invasion of Afghanistan was part of a secret plot to build a natural gas pipeline), I was surprised how reasonable I found many of the arguments in this book—a symptom, I suppose, of my own shaken faith in laissez-faire mantras in the wake of the 2008 crash and recession. Nevertheless, The Trouble with Billionaires has some significant flaws. For one thing, given that this book is aimed at Canadians, McQuaig and Brooks might have been more systematic in contrasting U.S. policies with their Canadian equivalents, instead of focusing almost entirely on the mistakes made south of the border. Where the material does touch on Canada, the treatment tends to be scattered and inconsequential—mostly consisting of a few stories about Canadian senators carrying water for their well-connected business buddies. At one point, the authors waste several pages complaining about the University of Toronto’s refusal to name its health studies program after socialized medicine pioneer Tommy Douglas. To McQuaig and Brooks, the example serves as proof that higher education is being taken over by Canada’s corporate plutocracy. A more reasonable explanation would be that experts disagree about the sustainability of Canada’s public healthcare monopoly; naming the health studies program after an icon of medicare would symbolically commit the university to one side of an important ongoing policy debate. We also learn very little about Japan and the countries of Scandinavia—even though, throughout the book, we are asked to regard their egalitarian social contracts as models for reform in our own country. The inclusion of just one or two charts presenting some basic information about these other nations—especially in regard to tax rates and income inequality—would have made this book seem more useful and serious. Conservatives, unlike the authors, do not even pretend to have a solution to the income inequality problem. I also found myself occasionally put off by the overly broad brushstrokes used to paint the ultra-rich. Billionaires are human beings, not bacteria or electrons. And as with all human beings, some have a benign impact on the world around them; others do not. Among the specimens profiled in The Trouble with Billionaires are financial vampires such as John Paulson, a hedge fund manager who made $3.7 billion in 2007 by betting against American homeowners’ ability to pay back their mortgages. But the authors also target Bill Gates, who developed a series of massively useful software products (including the one I am using to write this book review) and then donated over US$28 billion to charities that, in turn, have used his money to save countless lives all over the world. McQuaig and Brooks acknowledge this philanthropy in a few vague sentences before spending the next ten pages trying to portray Gates as shifty and undeserving of his fortune. At certain points in the book, one gets the impression that the authors simply do not like rich people on a gut emotional level—which takes away from the book’s otherwise highbrow analytical tone. On balance, however, The Trouble with Billionaires succeeds in communicating its core message: that creeping income inequality is a menace to the economies and social fabric of western countries, and that some form of redistributionist policies eventually are going to be a necessary antidote. Although I think the authors go too far with their policy prescriptions, I do see value in creating a debate on this issue. There is no question but that income inequality is a real problem in western societies and, aside from these two authors, very few Canadians are talking about it. Even in the shadow of the 2008 financial crisis and the American housing bubble—both symptoms of the excesses of hypercapitalism—the issue of income redistribution remains, oddly, a political taboo. In the United States, Barack Obama cannot even get the votes needed to eliminate a Bush-era tax cut for the top 2 percent of income earners. In Canada, Michael Ignatieff’s Liberals are so scared of being tarred as tax-and-spend profligates that they have signed on to just about every one of the Conservatives’ tax cuts. Even the NDP is rebranding itself to escape the socialist label. As McQuaig and Brooks argue, “progressives have largely folded their tent and gone home,” abandoning the ideological battlefield to conservatives. This is a problem because conservatives, unlike the authors of The Trouble with Billionaires, do not even pretend to have a solution to the income inequality problem. (Based on my experience at the Post, I’d say that most do not even think of it as a problem at all.) I cannot think of a single Canadian conservative aside from Conrad Black who has made any serious intellectual effort to reconcile his or her faith in capitalism with the free marketengendered meltdown of the American economy. Instead, they mechanically spout ritualized denunciations of the politics of “tax and spend”—as if the same catchphrases that worked in the boom years of 1995 or 2005 apply in 2010. This state of intellectual smugness is not sustainable. As income inequality becomes a larger and larger threat to our economy and society, politicians eventually will cast about for solutions. And in the absence of better ideas from conservatives, the ones they will embrace will look a lot like the ones offered in The Trouble with Billionaires.